If it has never happened to you, knock on wood, because for many getting their phone wet is something that has happened at least once. Whether you are on the beach and make a Baywatch run for the water and forget your phone is still on you, or you simply drop it in the pool at that crazy backyard party – it has happened to someone at least once. 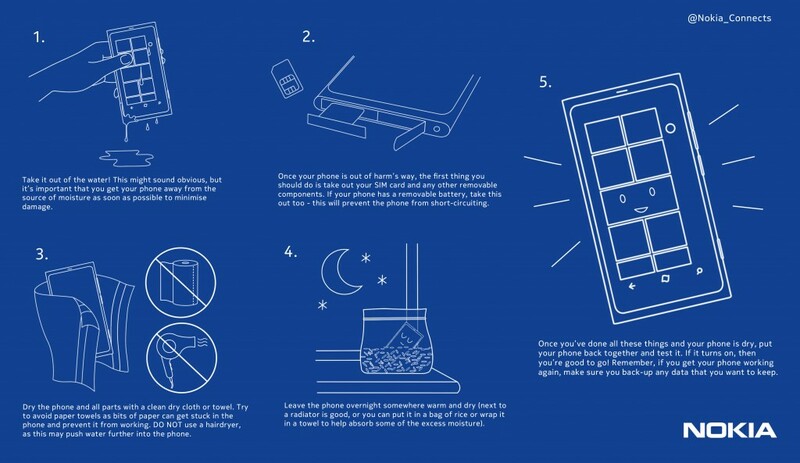 Nokia Connects has provided a 5 step infographic on saving your wet phone from drowning and dying on you. Give that phone CPR, quick! 1. Take it out of the water! This might sound obvious, but it’s important that you get your phone away from the source of moisture as soon as possible to minimise damage. 2. Once your phone is out of harm’s way, the first thing you should do is take out your SIM card and any other removable components. If your phone has a removable battery, take this out too – this will prevent the phone from short-circuiting. 3. Dry the phone and all parts with a clean dry cloth or towel. Try to avoid paper towels as bits of paper can get stuck in the phone and prevent it from working. DO NOT use a hairdryer, as this may push water further into the phone. 4. Leave the phone overnight somewhere warm and dry (next to a radiator is good, or you can put it in a bag of rice or wrap it in a towel to help absorb some of the excess moisture). 5. Once you’ve done all these things and your phone is dry, put your phone back together and test it. If it turns on, then you’re good to go! Remember, if you get your phone working again, make sure you back-up any data that you want to keep. Personally, I have tried both the rice and towel methods to absorb excess moisture, and that worked like a charm in my experience. I never took out the removable components of the device, just my luck I guess. Any methods you have used to save your mobile device after taking a dip? Let us know in the comments below!